Before I had children I used to buy children’s artwork, not from them but for fundraising purposes. I even co-chaired an event that sold children’s artwork exclusively for charity. And yes thousands of dollars were raised (all funds benefit the children). I even had a mini-bidding war with a friend over one piece titled “My Brazilian Family” – it was gorgeous, I lost. Children’s art work is outrageously good. Children’s artwork is not pretentious, it’s honest and present. While the cliche stands “my kid could do that”, in turn you could never draw like your kid. Cy Twombley is the only artist that had sufficiently mastered the child-like scribble language. This makes his large scale paintings with vulnerable scribbles seem so exciting. Trust me, it’s very, very hard to do. Much like collage work seems easy – Rauschenberg effortlessly made collages. Try making a collage artfully, and you will see that your work will resemble your high school locker door more than a work of fine art. I document my children’s artwork continually. 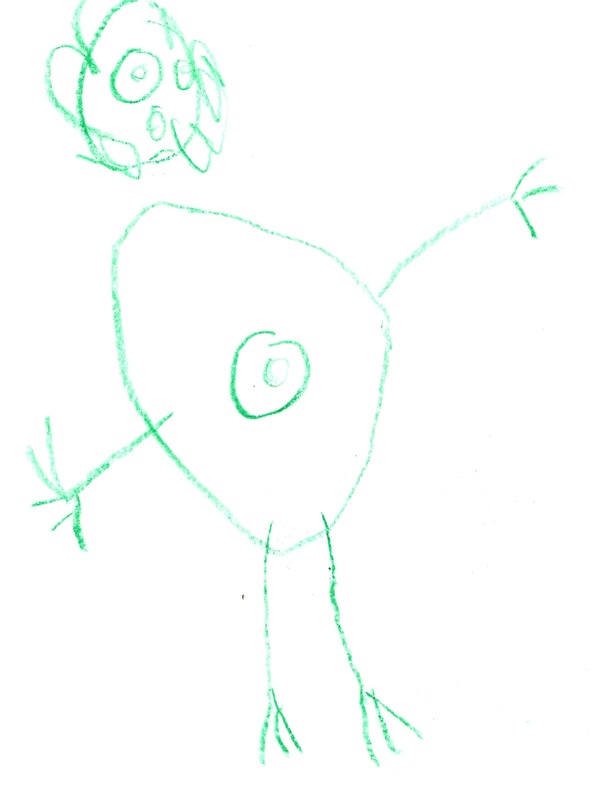 From my two-year old’s light scratches to my 4-year old’s insistence on making belly buttons on every single human figure he draws. A large belly button, sometimes as large as the head. There is magic going on here without a doubt. So what happens to this magic? The vulnerability and innocence is protected and patched up usually. And sometimes it’s not. Sometimes children become artists and their scratches become symphonies, murals, installations or performance pieces. While there are retrospectives of artists at museums, and sometimes at galleries, they usually choose the plum work. Never do you see the 20 messes they made before getting the one right, nor do you see work that stretches before their being “known”. So what pleasure I had learning of a new exhibit at the me Collectors Room in Berlin starting in January of artists’ childhood drawings titled PAPERWORLDS. 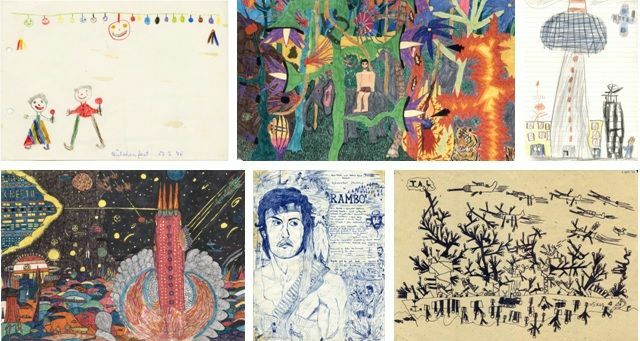 In the exhibition PAPERWORLDS, curators Valeska Hageney and Sylvia Volz present over 60 childhood drawings made by 19 living artists who are now international figures in the art world. Some of the artists include Norbert Bisky, John Bock, Andy Hope 1930, Jonathan Meese, Tal R, Katja Strunz, Rosemarie Trockel, and Thomas Zipp. The works are a rare, private glimpse of drawings they created between the ages of three and fourteen. The press release for the show questions whether we can see a parallel between the work made as a child and the work they now make. Without even seeing the work I can respond with a resounding yes. There is always connection to childhood – we are always the same person and soul, simply deluded and almost blind of the essential as we age. So will Rosemarie Trockel’s work resemble any of her installation work to date? Absolutely. Whether we are conscious of them or not, we have affinities to shapes, colors and feelings – these all come out in our work at each point of our evolution. If you’ve not been to the me Collectors Room in Berlin, I highly recommend it. Their programming is always fresh, and I love the premise behind the space exploring the concepts of collection and the wunderkammer.